With sums of 15, these 30 missing addends problems will make you smarter than smart! This zebra is in the right place with his 15 stripes! 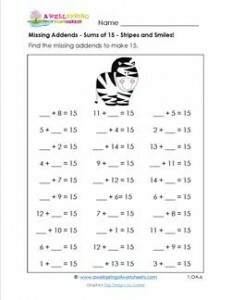 Please go to this page to see all the missing addends worksheets for sums of 11-15.